MONTREAL – A new era is set to begin in Montreal as the Alouettes announced that they have named long time NFL and NCAA coach Mike Sherman as the club’s new head coach, the 23rd in franchise history. The hire comes after the Als finished 3-15 and parted ways with former coach Jacques Chapdelaine in September and was replaced on an interim basis by general manager Kavis Reed. Although a new name in CFL circles, Sherman arrives with a long resume after spending time as both a head coach and offensive coordinator in the NFL and NCAA, primarily with the Green Bay Packers and Texas A&M Aggies. Sherman was the head coach of the Packers from 2000 to 2005 and also had a stint as the club’s general manager for a short period of time. While with the Brett Favre-led Packers, Sherman helped steer Green Bay to three division finals. His 53-27 record in Green Bay from 2000 to 2004 place him second in the club history with a winning percentage of .663 as a Head Coach. “My goal is to bring passion and accountability that our fans will see when the team plays this season. We need to give Montrealers a competitive team that strives to be at a championship level in everything we do as a team and as an organization. I am looking forward to talking to the players and hear their thoughts about this upcoming season,” added the new Head Coach. I have heard some great things about the Canadian Football League and I know that the fans in Montreal are passionate and we will give them a competitive team on the field. We know what’s ahead and we’re all looking forward to training camp next May”. 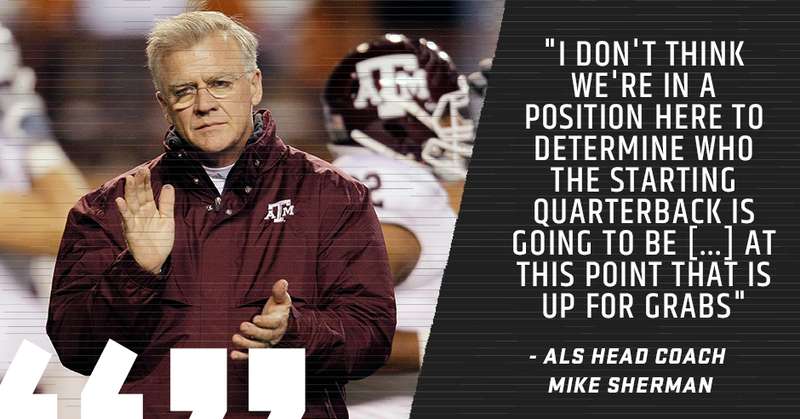 After spending a pair of seasons in Houston as offensive coordinator following his Green Bay days, Sherman was named the head coach at Texas A&M in 2007 and leading the Aggies from ’08 to 2011. Sherman subsequently worked for the Houston Texans as the Assistant Head Coach and offensive coordinator for two seasons in 2006 and 2007 before being named Head Coach of the Texas A&M Aggies in the NCAA in 2008. He led the team to three bowl games in four seasons while working with quarterback Ryan Tannehill. After four seasons in Texas, he returned to the NFL, this time with the Miami Dolphins as offensive coordinator for two seasons. Until May 2017, he was the Head Coach at Nauset Regional High School in Massachusetts. In October Coach Sherman agreed to work with the innovative startup Your Call Football (YCF). He will continue his position with YCF leveraging opportunities the startup presents for the Alouettes.